Representing the US at the World Championships, Canada Cup and Winter Olympics, Brett Hull added a silver medal from Salt Lake City in 2002 to his international resume, which already included a victorious run at the 1996 World Cup of Hockey. 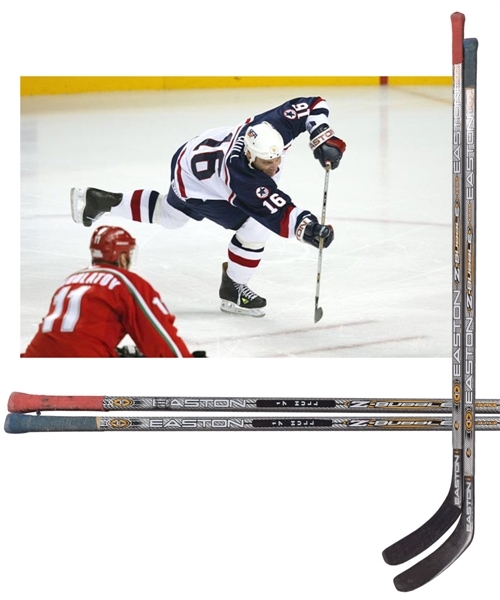 We have a pair of stick’s that saw action with Brett at the 2002 Games, with each Easton Z-Bubble model stick sporting the original tape jobs on the knobs (blue cloth on one, red on the other) and inserted Easton blades (one stick has had the blade tape removed). “17 Hull” factory graphics appear over each upper shaft, with “J.J.C.” handwritten over the lower shafts (the initials of Hull’s children), along with “Oly” on one stick, “Oly GM” on the other. A signed LOA from Brett Hull will accompany. Both sticks show light wear to the blades and shafts, with black tape residue left in a pair of spots on one stick, with this due to the sticks being previously bundled together.